As you all know, I love coffee! And mostly anything or everything related to it as well. So I was quite fascinated when I heard about a certain Play that is being shown in a coffee shop of all places! I heard about it last year and now I'm pleased to share that they have another running again coming within these months. Title pa lang ng play... hooked na ko! 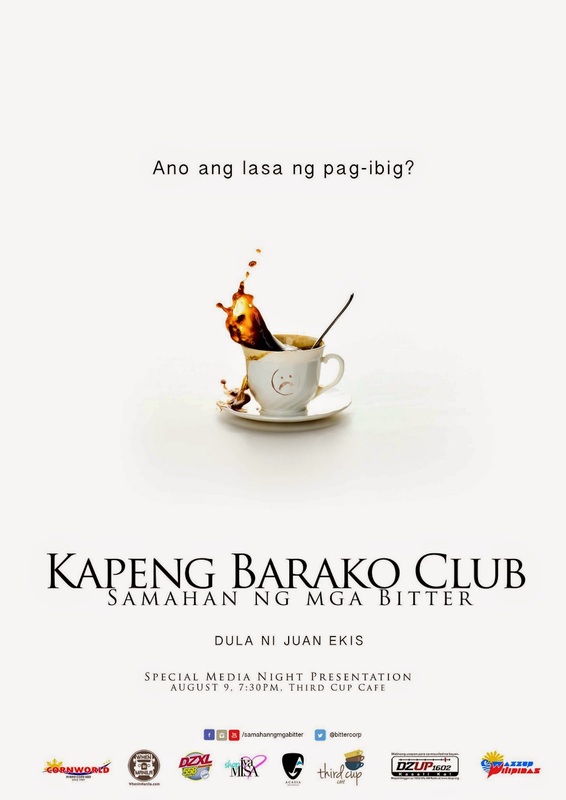 Learn more about this Palanca Award-winning play -- Kapeng Barako Club (KBC): Samahan ng mga Bitter. Being bitter never tasted this good! 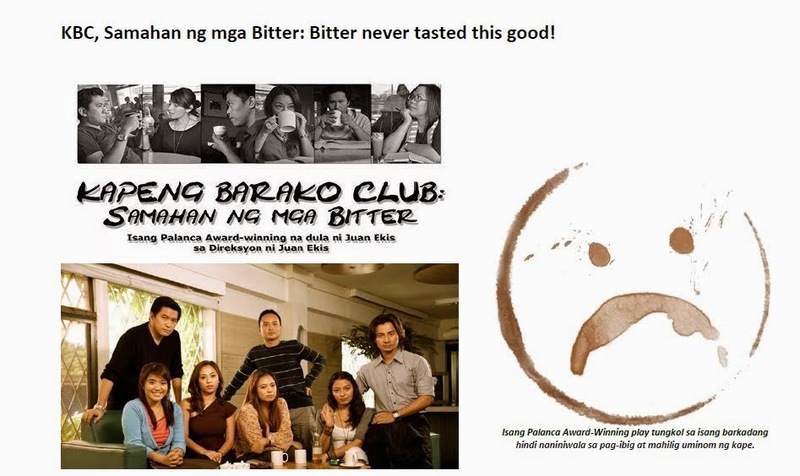 After almost a year, one of the country’s top plays is back, Kapeng Barako Club (KBC): Samahan ng mga Bitter. 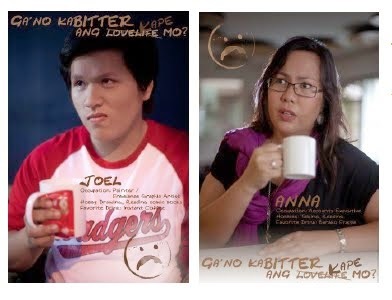 Staged in cafés, KBC is set to please kape lovers once more starting this September 6, 2014. The first show will happen at Third Cup Café, one of the premier, go-to coffee shops in Rosa Alvero Street, Katipunan Avenue, Quezon City. A Special Encore Presentation will be staged for Bloggers and the Media on August 9, 2014 at 7:30pm. This Palanca Award-winning play is written and directed by Juan Ekis, who is previously known for his other Palanca winning play "Twenty Questions" which went viral in the internet. The playwright shares with us that he “...just wanted to stage a play with the title Kapeng Barako Club: Samahan ng mga Bitter. I didn’t know yet what it was going to be about. But I just knew I wanted to write about types of people and the types of coffee they love and how their personalities are reflected in their drinks." KBC is the longest-running show presented by Arts and Culture Asia (ACASIA), a non-profit organization aimed at cultivating the crafts of thespians and showcasing their talents across different venues. “ACASIA’s advocacy is to teach artists how to manage their talents wisely and open avenues for them to show it and them being a part of KBC is one of it. Nestled in a natural setting (coffee shops), coffee drinkers get to enjoy a play like this. Think of it as if you’re eavesdropping. It’s actually fun!” says ACASIA’s Managing Director and one of KBC’s lead actors, Ms. Daianne Moreno. KBC unfolds the story of a group of coffee-loving friends who don’t believe in love but in reality, each one is dying to experience being loved. Masi, a vocalist for a band and engaged to Ed (ex love interest of Anna). 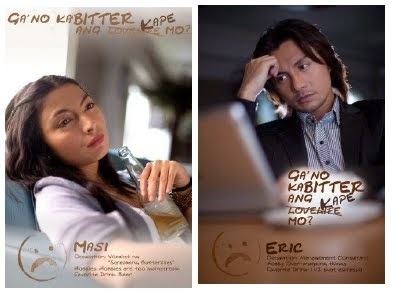 Eric, a consulting firm manager who finds it hard to express his true feelings for Masi. Interestingly, Masi has feelings for Eric too. Sunshine, the cheerful barista at Marlowe’s cafe. 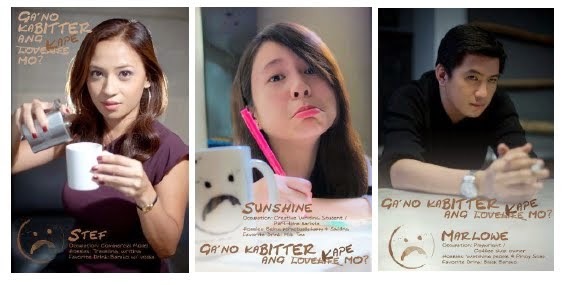 Kapeng Barako Club: Samahan ng mga Bitter is presented by Third Cup Café and CornWorld. Special thanks to Shop Iya Misa and our media partners WhenInManila.com, DZUP 1602 and DZXL 558. So Coffeeholics, if you want to watch something interesting while sipping some coffee, then you should definitely try this! Keep informed on their show dates by following their social media accounts above. Have a happy weekend!